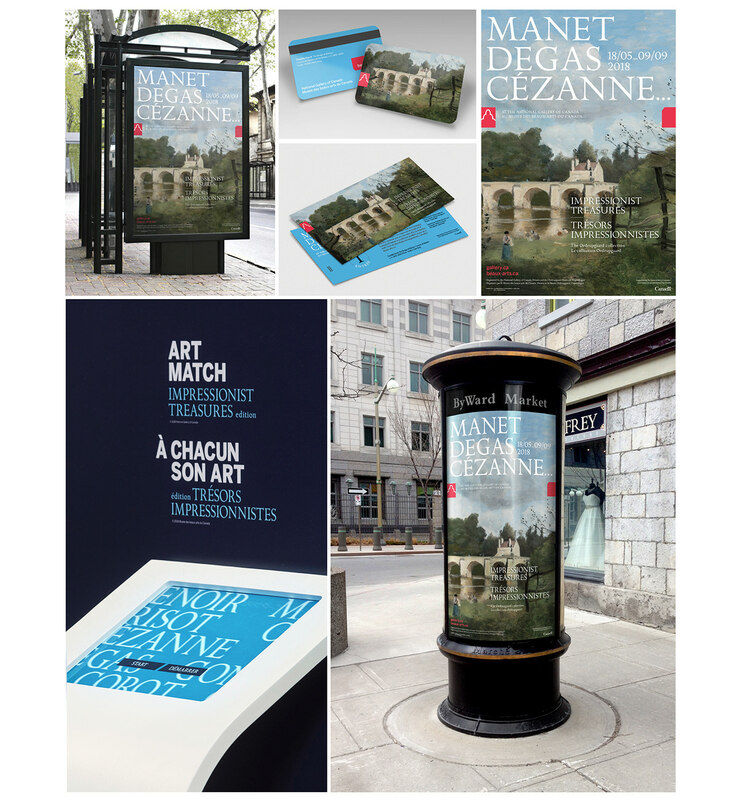 In 2018, the National Gallery of Canada’s summer exhibition, Impressionist Treasures featured impressionist masterpieces from the renowned Ordrupgaard Museum and its exquisite collection of 19th-century French paintings by the era’s most celebrated artists. In one compelling exhibition, the luminous landscapes of Corot, Monet, Sisley and Pissarro, the naturalist scenes of Courbet, the still-lives of Manet and Matisse, the intimate portraits of Renoir and Morisot, and the imaginative canvasses of Gauguin all vied. The design research revealed that the Neo-Classicist painter, Jean Baptiste-Camille Corot had significant influence on the nascent Impressionists, even though he, himself, was not an impressionist and he died soon after they began exhibiting together. With this knowledge in mind, we chose The Bridge at Mantes by Jean-Baptiste-Camille Corot as a starting point and feature work in the Campaign materials. 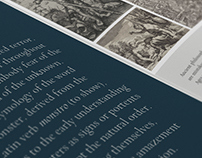 In addition, to emphasize the idea that the exhibition provided insight into an entire artistic movement, the promotional design incorporated the names of well-known impressionist painters such as Manet, Degas and Cezanne in large font type superimposed upon key imagery from Corot’s feature work, creating a memorable and high-impact design. 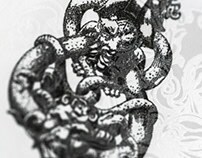 The campaign strategy was multi-faceted, ensuring a broad reach to diverse audiences. 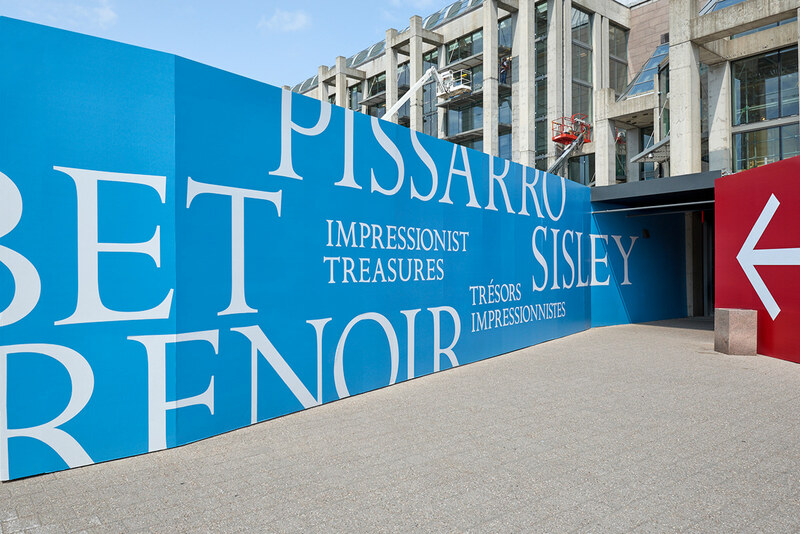 In all of the production and diffusion, the look and feel was consistent and resulted in pervasive branding across multiple channels, so that “Impressionist Treasures” became a familiar sight through the summer of 2018. We created a multi-channel campaign designed to appeal to a variety of audiences in novel and engaging ways. Also the Impressionist Treasures campaign visual was diffused widely and became pervasive across the region. It was important, however, that the Gallery keep in mind the breadth and diversity of its audiences and that this be reflected in its campaigns. The Impressionist Treasures campaign strove to do just that, and given the attendance numbers, and level of digital engagement, we believe that the goals were achieved. 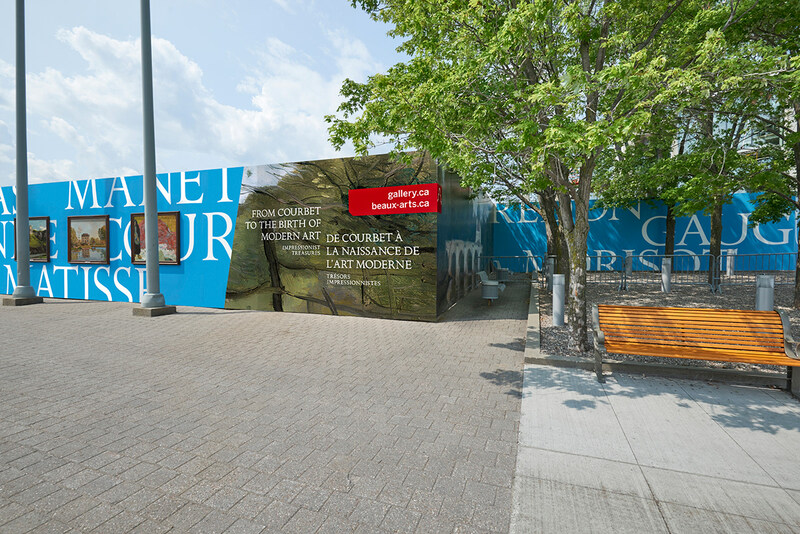 In an example of creativity and innovation, the temporary fencing used to cordon off the renovation activities taking place at the Gallery (which blocked the main entrance for the entire four months the exhibition was on) was converted into large-scale, high-impact advertising hoarding that featured our Corot-based design, reproductions of certain works, and the names of big-name impressionist painters. Because of the size of the hoarding, the street appeal was significant. 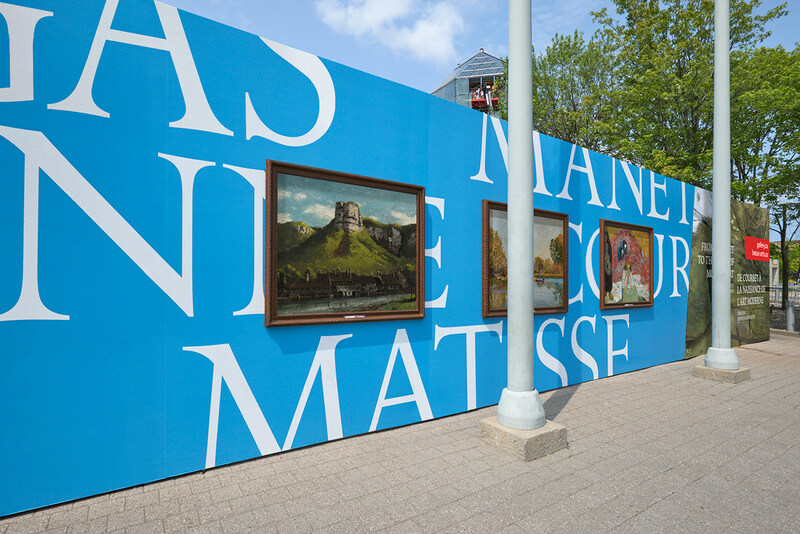 We also used Corot’s Bridge at Mantas as a backdrop for the National Gallery tree garden, put a street bench in front of it so people could enjoy sitting under the trees, when construction did not prevent access.